RENOVATIONS 200 • SHOPPING CENTER BUSINESS • May 2018 Retailers in the Las Vegas area are turn- ing to renovations in order to match the city's rapid growth. Such renovations can take three different forms, depending on the brand, location and unique goals for the space. We call these forms the three R's of retail renovation: refresh, reposi- tion and redesign. REFRESH For the projects that fall into the cate- gory of refresh, both the retail venue and brand are typically well-established in the market. The refresh renovation is objec- tively the simplest of all retail renovation types. This tactic is primarily implement- ed within existing structures, where the renovation work is limited to minimal architectural changes such as revisions to graphics, logos, color schemes or other key brand standards. Such projects are of- ten completed on behalf of major chains, as they lend well to the mass national roll- outs these brands desire. Refresh renova- tions are suitable for a wide range of re- tail uses, from banking organizations like Chase Bank to fast food establishments such as KFC. REPOSITION Reposition projects tend to be more significant in scope than refresh projects. This type of retail renovation can range from revitalizing existing retail centers in order to attract new tenants, through to facilitating a company's expansion and market growth strategies for exposure with speed to market. The scope of re- position renovations can include architec- tural elements such as entry portals and expressive storefronts or a complete new build-out of interior elements with consis- tent materials and design details. 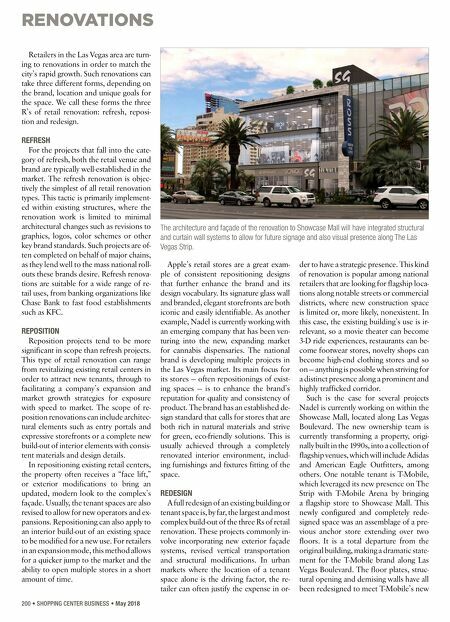 In repositioning existing retail centers, the property often receives a "face lift," or exterior modifications to bring an updated, modern look to the complex's façade. Usually, the tenant spaces are also revised to allow for new operators and ex- pansions. Repositioning can also apply to an interior build-out of an existing space to be modified for a new use. For retailers in an expansion mode, this method allows for a quicker jump to the market and the ability to open multiple stores in a short amount of time. Apple's retail stores are a great exam- ple of consistent repositioning designs that further enhance the brand and its design vocabulary. Its signature glass wall and branded, elegant storefronts are both iconic and easily identifiable. As another example, Nadel is currently working with an emerging company that has been ven- turing into the new, expanding market for cannabis dispensaries. The national brand is developing multiple projects in the Las Vegas market. Its main focus for its stores — often repositionings of exist- ing spaces — is to enhance the brand's reputation for quality and consistency of product. The brand has an established de- sign standard that calls for stores that are both rich in natural materials and strive for green, eco-friendly solutions. This is usually achieved through a completely renovated interior environment, includ- ing furnishings and fixtures fitting of the space. 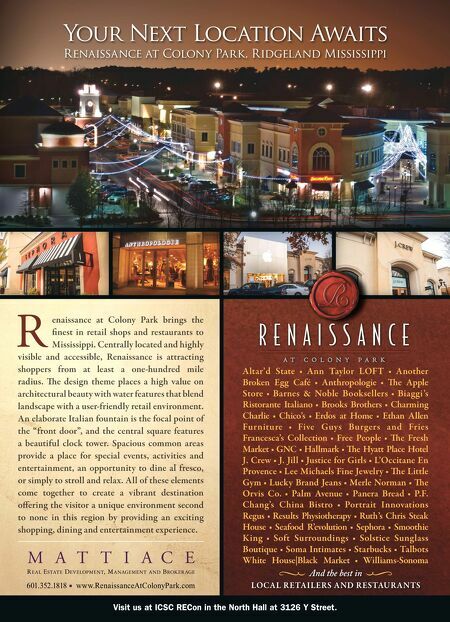 REDESIGN A full redesign of an existing building or tenant space is, by far, the largest and most complex build-out of the three Rs of retail renovation. These projects commonly in- volve incorporating new exterior façade systems, revised vertical transportation and structural modifications. In urban markets where the location of a tenant space alone is the driving factor, the re- tailer can often justify the expense in or- der to have a strategic presence. This kind of renovation is popular among national retailers that are looking for flagship loca- tions along notable streets or commercial districts, where new construction space is limited or, more likely, nonexistent. In this case, the existing building's use is ir- relevant, so a movie theater can become 3-D ride experiences, restaurants can be- come footwear stores, novelty shops can become high-end clothing stores and so on — anything is possible when striving for a distinct presence along a prominent and highly trafficked corridor. Such is the case for several projects Nadel is currently working on within the Showcase Mall, located along Las Vegas Boulevard. The new ownership team is currently transforming a property, origi- nally built in the 1990s, into a collection of flagship venues, which will include Adidas and American Eagle Outfitters, among others. One notable tenant is T-Mobile, which leveraged its new presence on The Strip with T-Mobile Arena by bringing a flagship store to Showcase Mall. This newly configured and completely rede- signed space was an assemblage of a pre- vious anchor store extending over two floors. It is a total departure from the original building, making a dramatic state- ment for the T-Mobile brand along Las Vegas Boulevard. The floor plates, struc- tural opening and demising walls have all been redesigned to meet T-Mobile's new The architecture and façade of the renovation to Showcase Mall will have integrated structural and curtain wall systems to allow for future signage and also visual presence along The Las Vegas Strip.